In the Earned Value Management System (EVMS) vernacular, Management Reserve (MR) is the budget set aside for Known Unknowns – not Unknown Unknowns. This distinction is important, as the budget at complete (BAC) plus MR equals the Contract Budget Base (CBB). Management reserve is typically used when an identified risk is realized (Known Unknowns). Once a risk has become a reality, such as re-work, re-test, re-make, more lines of software required, etc., the newly identified work required to satisfy the existing contract SOW must be scheduled and resource loaded (BCWS). This additional budget must be distributed to a CAM (or CAMs) via a work authorization document. The source for this budget is MR and not UB, as UB must have previously been logged with a predetermined budget and associated SOW. While the Unknown Unknowns could be estimated using simulations, models, etc., the project does not have the luxury to have such a budget set aside initially for an Unknown Unknown occurrence. If an Unknown Unknown becomes a Known, thus the newly identified risk becomes reality, the contractor could use the existing MR to budget this newly identified task or tasks to satisfy the contract requirement or prepare a change proposal for their external customer. When there is no MR, the contractor could implement an Over Target Baseline (OTB) in the event newly identified risks are realized with prior customer approval, as there is usually insufficient MR remaining. – The resulting answer will identify the schedule position on the program, a negative answer indicates a behind schedule condition some or all of the program tasks. A positive result indicates an ahead of schedule condition for some or all of the program tasks. – Always use this information to supplement the Program Schedule tools data which uses actual days/week/months to identify the programs schedule position. The Budgeted Cost for Work Scheduled, or BCWS, is the time phased value expressed in hours and/or dollars for all of the authorized budgeted work scheduled to be accomplished on a program. This is the time phased baseline from which all work performed is measured. The amount of time/duration that the planned completion dates have been missed by, the total number of days/weeks/months that an activity is behind to the original baseline dates. The VAC is computed by subtracting the EAC from the BAC. A negative result is unfavorable indicates the tasks being measured are forecasting an overrun at completion. A positive result is favorable indicates the tasks being measured are forecasting an underrun at completion. The Earned Value Guidelines define the EAC as the sum of the contracts cumulative to date Actual Cost of Work Performed (ACWP) plus the company project manager’s best estimate of the time-phased resources (funds) required to complete the remaining authorized work, the Estimate to Complete (ETC). This relationship is often expressed by the formula EAC = ACWP + ETC. Thus, the EAC is a forecast of the project’s final cost. The project manager may revise work priorities, replan remaining tasks on the project schedule and/or adjust the technical approach to complete the project’s goals within the estimated remaining resources. The goal is to complete all of the contract work scope within the Contract Budget Base–CBB(cost) and Contract Completion Date–CCD (schedule). The costs actually incurred and recorded in accomplishing the work performed on the program. The costs include Labor, Material/ Sub-Contracts, Other Direct Costs (ODC) and the associated Indirect costs applied to each category. The Estimate to Complete (ETC) is the company project manager’s best estimate of the time-phased resources (funds) required to complete the remaining authorized work. 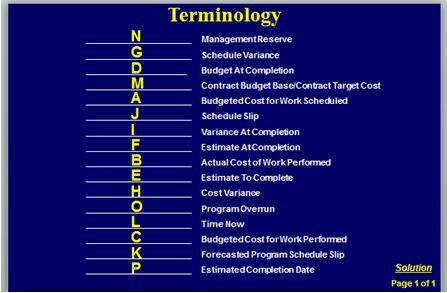 Cost variance (CV) which is calculated as BCWP minus ACWP. A result greater than 0 is favorable (an underrun), a result less than 0 is unfavorable (an overrun). Time Now is the end of the current (and cumulative to date) period that the data is being measured against. The estimated date that all authorized efforts will be completed. The Program began in January, the Time Now (L) is June or approximately 6 months into the effort. There are unfavorable Schedule (G) and Cost (H) Variances. The program was planned (BCWS-A) to complete in March. The Current Estimated Completion Date–ECD (P) is June which indicates a 3 month Forecasted Program Schedule Slip (K). The Budget At Completion (D) Was about $39M (including Management Reserve –MR (N), the Estimate At Completion–EAC (F) is about $56M resulting in a Program Overrun (O) of $17M. As you can see, selecting key measurement data metrics empowers the program manager with the information to estimate the impacts of early trends in the program. Using the data from analytical tools such as “EMPOWER” allows the program manager to evaluate the current status and develop corrective action and mitigation plans to help minimize the impacts to the overall contract and keep all customers aware of possible outcomes. We hope you found this two part article on Earned Value: Fun with Numbers useful. Feel free to share or call Humphrey’s & Associates for more information. Is it possible to use excel worksheet for this? Yes, an excel worksheet would work. After 19 years away from this I think I could still teach it. Earned Value Management: How Much Is Enough? Part 1 - Weekly Earned Value: Is It More Trouble Than it's Worth? Is it OTB/OTS Time or Just Address the Variances?